Dacia is putting the Duster Black Edition into production at a cost of £17,575. The car originally appeared as a one off at the Goodwood Moving Motor Show, but demand was sufficient to put the car into production. It’s available to order now, complete with black, brushed metal vinyl finish. It’s based on the two-wheel drive Duster Ambience dCi 110 and comes with ash leather interior, 18-inch alloy wheels, Kenwood media system, sat nav, DAB, Bluetooth, iPod connectivity, DVD playback and USB connectivity. The brushed metal ‘paint’ is actually a vinyl wrap. 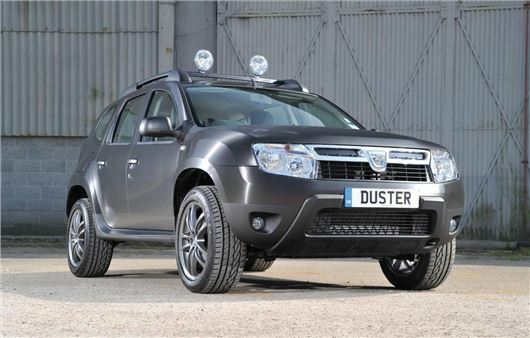 They cant meet demand for the current Duster models, how do they expect to manufacturer this one? They can meet demand at £17.500 try get one £8999 one you can't !